See the bottom of this page for a complete Spielberg filmography. A director who transcends mere competency in technique and reaches the level of mastery, via creativity and inventiveness, exhibits artistry rather than simply craft. Spielberg reached the level of artistry early in his career, as witnessed in his refined handling of long takes. 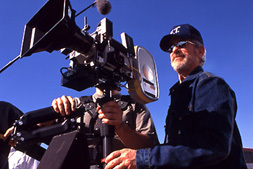 It is easy to argue that cinematographers may have influenced Spielberg’s frequent decisions throughout his career to use long takes rather than multiple set-ups. While not ruling out this option entirely, I would like to examine four significant long takes spanning 22 years of filmmaking in three Spielberg films shot by three different cinematographers. The consistency of technique suggests that the mastery of vision displayed in these four examples most probably emanates from Spielberg. Jaws was lensed by Bill Butler. A shot in the second scene is inventive in the way it uses space within the image. It is a static shot in the kitchen lasting 32 seconds, staged in depth, with Martin Brody in the foreground on the telephone, and his wife Ellen and son Michael in the background. Spielberg creates a productive tension between foreground and background. A telephone rings, and in the foreground Brody picks up a phone, but only gets a dial tone. He then puts the phone down and picks up another phone. From the one-sided conversation, we work out that someone is phoning about the disappearance of Christine Watkins. While Brody is listening to the details of Christine’s disappearance (which the spectator knows from the previous scene was caused by a shark in the nearby waters) in the background Ellen is cleaning a cut to Michael’s hand. He asks if he can go swimming afterwards, and Ellen agrees. The spectator can put together both pieces of information in the shot, and realize that it is not a good idea for Michael to go swimming, especially with a blood-stained hand in shark-infested waters. But neither Brody nor Ellen can put together the two separate pieces of information. Jurassic Park was lensed by Dean Cundey. In the scene in the lab, a tour is taking place for the main characters, who witness the birth of a raptor. The scene begins with a 44-second establishing shot, consisting of the camera tracking back, which continually introduces new foreground space that creates a deep focus shot. This shot begins with a computer image of dinosaur DNA and ends on the dinosaur eggs. The camera therefore begins on the initial process of building a dinosaur (a computer screen displaying dinosaur DNA) and tracks back continuously to reveal significant off-screen space, culminating on the end result of building a dinosaur – the hatching raptor eggs. Jurassic Park: The Lost World was lensed by Janusz Kaminski. Shot 2 of the opening scene is a 52-second long take with extensive camera movement. The shot begins with the camera panning down from the sky to a beach. It then tracks right and stops when a yacht comes into view in the background. A crewman enters screen right in the middle ground carrying a bottle of champagne and the camera tracks left to follow his movement. Almost immediately another crewman carrying a bottle of champagne enters screen right, this time in close-up in the foreground (only the bottle and his hands are visible). Therefore, within a few seconds several planes have been introduced, although they are not shown simultaneously, and are filmed using selective rather than deep focus. The camera continues to track left, covering the ground it tracked at the beginning of the shot, but this time it reveals a family on the beach. The remainder of the scene is constructed using editing. As with the example from Jurassic Park, the camera movement in this long take creates a structural relation between on-screen and off-screen space. Spielberg combines the long take with deep focus in the scene where Ian Malcolm visits Hammond at his home. While waiting in the hallway talking to Tim and Lex, Hammond’s nephew, Peter Ludlow, enters. 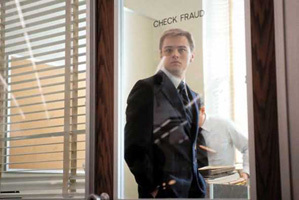 As he signs documents in the foreground, Malcolm, Tim and Lex are shown in the background. Malcolm then walks into the middle ground to talk to Ludlow, and in the background the children prepare to leave. As well as consisting of genuine deep focus and long take (of 73 seconds), the shot is positioned at a low angle, revealing the ceiling. Numerous other examples of film artistry (including many more creative and inventive long takes) can be discovered in Spielberg’s filmmaking. Dr Warren Buckland is Associate Professor of Film Studies at Chapman University in California. He is author of The Cognitive Semiotics of Film and Film Studies, co-author (with Thomas Elsaesser) of Studying Contemporary American Film: A Guide to Movie Analysis (NY: Oxford University Press; London: Arnold, 2002) and editor of The Film Spectator: From Sign to Mind (Amsterdam UP, 1995). He is also editor of the new paper-based journal, the New Review of Film and Television Studies. To date many reviews of Amistad have rightly highlighted the film’s indictment of American history and justice. But the film ought to be taken seriously for its exploration of an even more ominous issue – that of having or not having a voice. Spielberg has taken the concept of the freedom of speech to its metaphoric level – that of speaking a different tongue, a different voice, and hence one’s inability to be heard. The film is one of extraordinary poignancy. It tells the story of Cinque (Djimon Hounsou), and his fellow slaves’ attempt at freedom after killing the crew of the slave ship, La Amistad. Now imagine this. It is 1839, slavery has been abolished in the North, and the South is ready and willing to go to war on the issue. It only needs a spark to set the bush on fire. Spielberg pits a former American president against another irascible president in a conflict that culminates in the “trial of the century.” The slaves have to argue their case against re-enslavement on the basis that they are from Africa and therefore according to American law they are free people. This is opposed to the argument that since they were on a Spanish ship, and because nobody can prove that slave trading continues in Sierra Leone, the slaves are the property of Queen Isabella of Spain. As the case moves to the Supreme Court the renowned lawyer and former US president John Quincy Adams (Anthony Hopkins) is drafted to the defence leading to one of the most memorable court scenes in cinema. In a gruelling 15 minute speech (the real one is said to have run a total of eight-and-a-half hours) Spielberg risks all and delivers a tour de force of acting, drama and cinema through the legal arguments put forward by Hopkins. The film is in fact a romantic representation of American justice consistent with classical Hollywood narrative. However, Spielberg is able to bring the deep racial thesis of the film to its appropriate political level, denying liberal America their usual site of control of the cultural encounter. By questioning the rightness of forcing the slaves to defend themselves in a language they don’t understand, in a legal system they don’t comprehend, Spielberg is undergoing the Socratic self-examination in which one is able to argue for an opinion that one does not even believe in. He is forcing the viewer towards a narrative imagination: to think in someone else’s shoes and in that way get the imagination going. Although Cinque doesn’t speak English, when he says “Give us free” we hear its translation in the myriad languages of the world and understand its power. As an African I was not totally taken in by the emotive depiction of the boat and the massacres. I think I have been inured to such images. However, what impressed me most is Spielberg’s identification with the lowest common denominator of dispossession, of absolute powerlessness, that any person could find himself or herself in. I identify with Cinque through the position of powerlessness that I have often found myself in. May it then be said that Amistad rises to the level of a parable of the powerless? May we read therein the story of Africa’s powerlessness economically, where no language can explain what IMF’s tomorrow means to many African countries that find themselves in this powerless bind? May we even then read in it the parable of the weak `Arab nation’, as they watch over their riches and their history being turned into a laughable spectacle? Or even the Indonesians…? Which measure of justice shall we use? It is only through the hegemonic relationship existing between the dominating, not dominant, western philosophy and other cultural philosophies that we can explain why we seem to agree with the court’s decision. The discourse of the law is the discourse of authority. Law is always used as a mediating factor between right and wrong, right and might, truth and falsity. Many of Spielberg’s films advance that discourse in no uncertain manner. Martin Mhando is a lecturer in Media Studies at Murdoch University, Western Australia. When I think of Schindler’s List there are some scenes which epitomise everything I hate about Steven Spielberg’s filmmaking. There’s a scene in which the ultra-tall, ultra-blonde, and ultra-heroic Oskar Schindler (Liam Neeson) watches Jews being rounded up in the Cracow ghetto. His eye and ours fall on the figure of a small girl in a red coat dodging through the legs, and the panic, and the terror. She disappears from our sight, but later, we catch a glimpse of a small red coat thrown on a cart. Ah, that girl in the red coat! Pristine, anonymous, tasteful. How could anyone fail to be moved by this travelling blob of terrified innocence? It was a cliche of old-master painting to place a dot, a splash of red in the foreground to draw the eye, to force the perspective. Spielberg leaves nothing to chance. We know nothing about her, of course. Just as we know nothing about most of the Jews in this film…apart from Ben Kingsley’s portrait of the accountant, Itzhak Stern, and the young Embeth Davidz’s Jewish girl brutalised by an SS Commandant. For the most part, they are treated by Spielberg as a class, a group, a category: Jew. Even the family we see being brutally evicted from their apartment disappear from the narrative. But they’re not given identity in the first place. The scene with the little girl in the red coat was, reportedly the subject of a dispute between Spielberg and the screenwriter Steven Zaillian, who feared it an overly sentimental touch. Spielberg prevailed. Like the neat folds in the headscarves of the women waiting to be herded into the camps, the small girl in the red coat for me stands for the shortcuts Spielberg so often takes for affect, his failure to respect our emotional intelligence. As film critics and theorists, we tend to appreciate the works of directors who reveal to us intellectual processes rather than emotional ones, but Steven Spielberg is definitely a filmmaker who seeks mainly to reach us through feelings and emotions. To attain this goal, he uses the first expressive means of cinema: lights reflected on the screen. We can recognize in his style a kind of ‘fiery lights’ motif that figures constantly and coherently through most of his films. Not only does it reveal the behavioral patterns of characters with whom it is associated, but it also enriches the readings of Spielberg’s films on a moral and spiritual level. The fiery lights create a link between the “Fiery Bush” of the Bible and the “Sacred Heart” of Jesus Christ, connecting the Old and New Testament, Judaism and Christianism, Jewishness and Americana, dualities which reflect Steven Spielberg himself. Through this understanding, his oeuvre acquires a humanist value and a noble purpose not often acknowledged by the academic community. 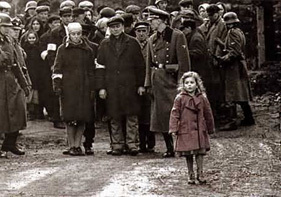 This motif is most exemplified by asking the following question: why is there a little girl with a red coat in the otherwise black and white Schindler’s List? To symbolise innocence, hope or the red blood of the Jewish people being sacrificed in the horror of the Holocaust? The red coat girl is seen in only two scenes, always through the optical point of view of Oskar Schindler. It joins other color elements: the match and the candles of the opening credits, the flames of the candles in another Sabbath celebration, the two red roses at the end (an entire color scene) being put on Schindler’s grave by actor Liam Neeson. The red coat, roses, flames and incandescent lights all represent life and could symbolize the Fiery Bush, the “Will of God” narrated in the book of Exodus. Furthermore, one image in the film stands out when Schindler faces his office window overlooking the factory: on his chest, on his heart, is reflected the dazzling radiance of the furnace’s fire. It could very well bring to mind the Sacred Heart of the Catholic faith, the “love of Christ” who is defined as “the light of the world” in the Gospel according to St John. Thus, both religious symbols are fused together in this image that proclaims Schindler’s transformation from the ardent Austrian capitalist to the repentant Catholic savior of 1100 Jews. The red coat only seen through Schindler’s eyes defines visually his motivation. He is so moved by this vision (as we are!) that he decides to engage in this altruistic endeavour. That is why the red coat incarnates the Sacred Heart, and the match, the candles and the furnace imagery stand for the Fiery Bush. A moral choice has been made and Schindler becomes a modern Messiah, linked to us by emotions. Since Spielberg wants to affect us on an emotional level, it is mainly the visual stylist in him rather than the American Jew who speaks to us here. He uses powerful religious and mythical imagery, even if they don’t come from his Faith. It is the striking visual impact of those images that counts. For example, the fiery heart of Oskar Schindler sends me back directly to E.T. The Extra-Terrestrial whose journey, like that of most American heroes, parallels the life of Christ. Like Jesus, he comes from the stars and is hunted by the authorities, he accomplishes miracles (Elliott’s finger, the flowers, the moving objects, the flying), dies, resurrects and reveals himself to Elliott’s Apostles (the kids), he shares his spirit with Elliott (“I’ll be right here”) and ascends finally to the stars in a pilar of lights (the rainbow). But mainly, E.T. has a radiant red heart and a vital “light” essence which he transmits through his yellow finger to bring life. Like Oskar, E.T. sacrifices himself to bring Elliott back to life and, like Oskar, E.T. demonstrates a vitality and a humanity that can elevate the public spiritually through the image of the Sacred Heart. E.T. is thus part of the fiery lights motif. A.I. Artificial Intelligence also fits nicely into the equation. In the bedroom of Monica’s son where the android David is living, there is a bed ornament showing a woman holding two children. Made of silver, the woman has her heart cut out, leaving an empty space, a metaphor very telling in Monica’s situation, because she will have to choose between David and her own resurrected son. Later, David is abandoned in the forest and finds his way to Rouge (!) City, where he first seeks the help of “Our Lady of the Immaculate Heart” (!). At the end, David lives one last day with Monica and she bakes him a cake on which there are seven candles (a very significant Hebraic number). David blows the candles, leaving one lit and its flame is reflected directly on his heart, David’s Sacred Heart, like E.T.’s, like Schindler’s, a loving heart that becomes most human at last. It is very significant that this story was first sought out by Stanley Kubrick, who in 2001 : A Space Odyssey showed the Star Child occupying the physical space of the dying astronaut on the bed. The Star Child emerges from the chest of the man and then goes on to take the place of the Sun in Earth’s sky. The fiery lights motif also shines on Kubrick. Thus, the emotional Spielberg joins the intellectual Kubrick in the league of extraordinary American filmmakers. André Caron teaches cinema at the cegep (or college) level, and since 1988 has written reviews for Mediafilm in Montreal (at www.mediafilm.ca). He also writes occasionally for the sites Horschamp and Offscreen, and for fourteen years (from 1986 to 2000) contributed to the French magazine Sequences. He is presently completing a Master’s Degree at Concordia University in Montreal. I try to get them to fool me, to pretend that they’re the character. Kids are marvellous actors, and when you have kids of your own you know that they’re acting half the time to get what they want. And they’re very, very convincing. Acting is merely pretending, and using your imagination to elaborate on the pretense. But you don’t have any special technique in working with children than adults, except that you adapt yourself to what you believe and can determine as the actor’s needs, and every actor has different needs and different insecurities, which you try to bolster and give support to. And since they have different needs, you give different supports. Of course the very notion of child acting is a complex one to begin with; we may often ask ourselves how such a small and fragile body, with not yet enough knowledge of the world and all its contradictions has the strength, concentration and technique to create recognisable facsimiles of human behaviour. The answer may be in transforming the natural make-believe of children’s plays into the theatricality of the symbolic game and itself in creative imagination. Game-play enables the child’s conscience of the as if to become gradually articulated into an artistic language – the art of acting. In theatre actors do have to sustain a performance in its continuity, but film is the art of fragmentation, with performances spliced in little bits by its filmmakers; this fragmentation makes possible an approach to acting based not only in an intellectual/emotional identification but also in its physicality, the very nature of imitation for children. You also don’t have to have a complete understanding of the narrative, the story being told; children can enjoy solely the meanings of each fragment, the pleasures of its own internal games. Our cinematic memory is populated with a multitude of memorable child performances, and Steven Spielberg quite often elicits complex and mature ones from his child actors. He understands with great sensitivity their needs and seems to know intuitively their strengths and insecurities. And he knows, like all the best directors of children, how to transform the symbolic reality of game-playing into an acquiring of texture and substance in performance, concurrently materialised in body gesture, movement, space and time. 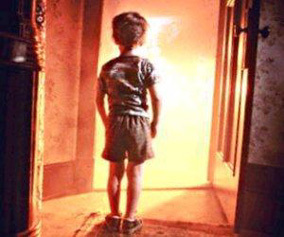 From Cary Guffey’s immediately identifiable innocence in Close Encounters of the Third Kind (1977), eyes attracted by strangely seductive colors, lights and sounds, the sense of wonderment, curiosity and primal fear embodied in the awkwardness of his small body, gestures and movements as evidenced in the bedroom scene, when all toys come mysteriously, magically and seductively alive propelling him to go from the securities and loneliness of the interiors of his home and self to the more dangerous, adventurous discoveries of the outside, to Christian Bale’s stunning performance, a more grown-up child in Empire of the Sun (1987), making us feel his constant struggle for survival in a world physically and emotionally in ruins, growing, through the games of life, from an obnoxious and pampered little brat to a boy who can make choices and is able to make productive use of his unlimited and creative energy. 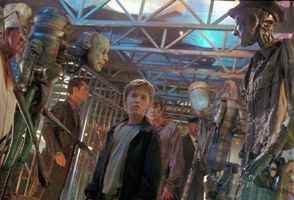 I would like to praise one of the most memorable collaborations between Spielberg and a child actor: Haley Joel Osment’s complex, multilayered, at the same time touching and completely unsentimental performance as the robot David in A.I. Artificial Intelligence (2001). There’s a particular scene in it that I would like to focus: in the early family scenes we watch the arrival of the other son mysteriously healed from a fatal disease, Martin (Jake Thomas); soon the boys are competing for familial affection, making silly games with food, and more dangerous ones with scissors, and this tension makes its emotional apotheosis in the party by the swimming pool. We watch little boys playing in the water, with Martin and David isolated by their predicament and because they are different; the first one is not able to walk properly yet and can only become a spectator; the other is a MECHA, not an ORGA, this difference printed on his body in the form of a chip. The other boys tease David, touching his body, asking him if he’s able to pee, and what size it will be (cruel and sadistic little games children sometimes do between themselves) and finally decide to take a knife and see if he will feel any pain. It is then that something astonishing happens: until then Osment’s face and body adopts a passive reaction, opaque and slightly steely, but at the threatening of the cut, his face, taking the shape of a primitive mask that would make Kubrick proud, comes electrically alive, and as he grabs Martin by his shoulders for protection he accidentally drops them both in the water. Martin is saved; David remains in the water, his eyes like the ones of the foetus in the finale of 2001: A Space Odyssey, the water his amniotic liquid, longing to understand the mysteries of life and love. It is a tribute to Spielberg and Osment’s considerable talent for game-playing that such strong associations can be achieved. Jorge Didaco is a 36-year-old Brazil-based teacher and writer in theatre, performance and film. Love and genuine feelings have been thoroughly trivialised in the commercial American film through the years. It is easy to reject scenes with such content out of hand, purely as a reflex reaction developed over time to protect against emotional manipulation. This syndrome is coming fully into play concerning the (in)famous reunion sequence between David and his mother that concludes A.I. Artificial Intelligence. This sequence is a notorious Exhibit A in many a contemptuous dismissal of the film. Things are not made easier by Spielberg’s dubious past record in these matters. One of the greatest objections to him as a true artist has been his penchant for easy sentimentality, especially in his endings. In works where he attempted to show his serious side, scenes that were supposed to be moving and genuine often came across as manipulative and banal. But one of the greatest pleasures of A.I. is Spielberg’s majestically assured ending, even if it seems to be the most shamelessly sentimental of them all (”David wants his Mommy? Let’s bring her back from the dead!”). However, Spielberg here at last rids himself of his most troublesome artistic Achilles’ heel, by a brave and paradoxical act: actually magnifying his patented ‘happy ending’ to its extreme. It suddenly works and it is as if he has been working towards this moment for his whole life. Now the combination of Kubrick’s innovative, intelligent groundwork and Spielberg’s embrace of big emotions has, at last, provided the necessary foundation for this kind of ending to succeed. The ending of A.I. is genuine and deeply moving, intellectually satisfying as a logical conclusion to the working through of the themes, and thematically it resounds with subtle echoes from the rest of the film. People who think that this ending is purely sentimental slush should give it another try. The ending is actually doubly resonant: it is equally moving regardless of whether a) David receives a genuine declaration of love from a ‘real’ Monica, or b) the longing for love, the all-consuming need to fulfil his wishful dream, is so strong that David, consciously or unconsciously, settles for a staged and artificial declaration of love. One of Spielberg’s favourite motifs has been the happy family situation, and here he achieves his most perfect expression of this. Two shots deserve special mention: the one in which Monica playfully shapes David’s soapy hair into a Mohawk, and the one in which they gleefully shout ‘Booo!’ emerging from the cupboard during the hide-and-seek game with Teddy. Seen in context with the rest of the film, Spielberg transforms these shots from cliché into one of the most joyfully sparkling images of totally carefree happiness in film history. At the same time however, an undercurrent of escapism and illusion murmurs beneath it all, whispering that it is just an idyllised situation, an unreal family paradise staged and played out by artificial beings. Our awareness of these two conflicting emotions, joy in happiness and sadness in the unattainability of it, makes the sequence even more resonant. Perhaps, after all, one prefers to believe in the joy. At one time the disoriented Monica asks which day it is, and David simply responds “It is…today”. When Monica, way back in the past, suggested they go on a picnic together, it was just a lie to trick him into joining her on a trip to return him to the factory and his destruction. During the lie she said “Tomorrow’s going to be just for us.” Now, two thousand years later, that day has arrived (“The new morning has come,” as the spokesman for the super robots said just before), and while the human race has gone, both of them have finally got the day that her terrible lie denied them. It’s ridiculous to imagine that upon its release, Steven Spielberg’s A.I. Artificial Intelligence was deemed compromised by, perhaps even ridiculed because of, its final half-hour. Fittingly, as Spielberg has noted, the film was met with a decidedly Kubrickian reception. In fact, the recent Eyes Wide Shut could be its most identifiable frame of reference: in both films, the protagonists wander through a nightmarish, ever-morphing cityscape, make dubious discoveries about themselves and their fellow man, only to eventually be returned to a domestic warmth so chilly that the line between reality and fantasy never becomes fully delineated. The reaction to A.I. was more violent due to animus towards its surrogate director, and the film’s synthesis of postmodern Western critique, cinema-history recall, childhood inquiry, and fairy-tale deconstruction was considered unwieldy, lopsided. Yet its detractors missed that after its lambasted 2,000 year hurdle, Spielberg’s various threads ultimately merged; they only saw what they chose to believe – that the wish-fulfillment finale was to be taken literally, that no matter what the context, Spielberg would opt for the final exaltation, the spiritual uplift that eradicated all doubt and cured all irrational fears gleaned off from two hours of discomfiting viewing. Most cynical viewers scoffed when the robot-boy David was freed from the eternally frozen amphibicoptor, as if it were his responsibility to remain frozen in time, their time; if David – trapped under the Ferris wheel cage, staring at his “ever-smiling” yet hopelessly unresponsive God figure, the Blue Fairy – wasn’t merely meant to embody reducible existential angst, then what could his journey teach us? Those who turned away from David’s plight as Spielberg jerked them 2,000 years ahead to a glacial afterlife, branded it a “happy ending” and moved on. But the question should be posed: is David truly excavated from his prison of memory, hope, and eternal wishing? David’s pre-programmed Mommy complex is merely a flashing bulb encased in an incomprehensible sorrow trapped in a submerged metropolis abandoned by a corrupt world order. Humanity hasn’t merely lost sight of itself, it’s turned a blind eye. For David to be the remaining link isn’t a cosmic joke so much as a fitting epitaph. When the lights fade out on the imaginary house floating somewhere between Earth’s core and the dream world, one gets the sense that David has never truly emerged from the amphibicoptor trapped beneath the waves. A.I. begins and ends with a tear sliding down a robot’s face. In the opening scene, the test subject Sheila (who bears more than a passing resemblance to David’s eventual “mother” Monica, as well as the mechanical au pair melted in acid at the flesh fair – Monica is never made aware of her own robotic simulacra) remains stone-faced while her maker, Professor Hobby, reaches inside her mouth and peels back her flesh. Yet when the shiny silver of the metallic face beneath reveals itself, the camera barely notices as a drop of water escapes from its eye-socket. A tear? A stray drop of condensation? The film, Spielberg’s (not Kubrick’s) lamentation for the human species, is book-ended with David shedding a tear over the resurrected body of his programmed mother, soon to perish once more. And everything in between those two shots is distilled in a visual idea worthy of Dreyer: Jude Law’s Gigolo Joe, in giant close-up, witnessing David’s suicidal leap from the top of Cybertronics, reflected as a tear descending down his immaculate cheek. A film of mournful sadness, A.I.‘s final rebirth doesn’t express the triumph of the human condition or provide simplistic closure for the audience. It’s an emotional release of a wholly different sort. Why is there catharsis in a film that ends in solemn death? The answer could lie in Bresson’s Au hasard Balthasar. Time and again, Bresson achieved a spirituality summoned up from despair of which Spielberg seems to remain around the perimeters in works like Always and Empire of the Sun. Yet Balthasar and A.I. are remarkably similar: both feature as protagonists creatures vilified by their fellow beings, ultimately deified by a greater ethereal omniscience, whether it be through theological or metacinematic discourse. Both Bresson and Spielberg ultimately sanctify their inhuman heroes through the act of witnessing. The donkey Balthasar and the robot David both only wish for one thing – the reclamation of childhood, the embrace of the maternal, a love as undying and pure as their own. Instead they witness the pain humanity causes to itself, finally returning to the transcendent serenity from which they came, only now in a liminal rather than physical space. Through Kubrick, Spielberg finally found a way to let the childhood imagination triumph, the Pinocchio myth comes full circle. David cries and does indeed become a real boy. Balthasar, wounded, knuckles down amongst the flock of sheep to die; beneath the gaze of a flock of beatific angel-mechas, David lies down beside his mother’s corpse and goes “to that place where dreams are born.” To enter mortality is to be faced with death. As David closes his eyes, he resigns himself to this concept. Michael Koresky is an editor and staff writer at Film Comment and Reverse Shot magazines. Steven Spielberg has forged a social contract with the mainstream audience: his annual box-office behemoth delivers thrill-ride sequences, demonstrations of up-to-the-minute technology, and – with his own kind of emotional fundamentalism – simple jolts of fear and surprise and relief. In return, ticket buyers agree to humour his taste for family disintegration stories typically centered on a stricken man-child (though too much brow-furrowing made the cracked poignancy of A.I. unwelcome in the multiplex). Alternating hyper-stimulated action scenes with increasingly depressive melodrama, the director now seems to use his visual flair to bipolar effect. His last three films have revived the romantically portrayed transgressors of his first (The Sugarland Express) with the quasi-boy on the run (A.I. ), the policeman forced to become an outlaw (Minority Report), and the good boy driven to the criminal life (Catch Me if You Can). Marketed as a frothy frolic, Catch Me if You Can sketches the real-life career of Frank Abagnale Jr., whose varied personas exposed the poorly guarded professional boundaries of medicine, law, and the airline industry. Buoyant as long as it traces the anatomy of each scam, the film turns cheerless when Spielberg forces this story into a mournful fictional triangle: failed father plus surrogate father plus wounded Lost Boy. In one of the film’s five Christmas scenes, the emotion culminates in a jewel-like Magical Child moment after Abagnale learns of his father’s death. Distraught, he escapes off a plane in the midst of landing, and then races through the snowbound suburbs to his mother’s new home. Outside the frost-covered window, while the soundtrack croons “The Christmas Song,” he sees the sister he didn’t know he had. For one improbable minute, separated by glass, they communicate as he realizes that this family unit excludes him. The little girl shows no alarm at this stranger staring through the window, but he is wide-eyed with grief, yearning for the love and safety of this idealized suburban hearth, like Stella Dallas shut out from her daughter’s wedding and forced to watch from the street. The exquisite salon lighting makes this a powerful fetish-image of adolescent angst, conveying some of the direct emotion of silent cinema, yet it equally looks overdetermined, self-consciously composed to evoke a primal pang of grief and hurt. But for whom? Not Abagnale, because he actually grew up with three siblings, all banished from this narrative. Is Spielberg speaking for all rejected children and outsiders? Then why bother to stuff this content into Abagnale’s story? In fact, why not tell the real story, the one with no sympathetic G-man, the one where Abagnale credits his social transformation to his wife rather than the FBI? Hints of an “us vs. them” social critique, perhaps survivors from a previous script, suggest meanings that might support the emotional indulgence. In a birthday party scene, the father gives the teenaged Frank a checking account, calling it an introduction into the elite world of finance: “From this day on, you’re in their little club”. Later, a call girl negotiates her own exploitation (“If they sold me at the gift shop, how much would you pay for me…for the entire night?”). She sells herself, and Frank buys her, equating flesh and money, but Spielberg’s James Bond allusions blur the argument. Likewise, the director muffles the irony of the failed patriarch, harassed by one government department (Internal Revenue) while working for another (Post Office). Finally, young Abagnale’s attempt to marry wealth in New Orleans also has implications that get buried in a pumped-up party sequence, with DiCaprio escaping down a giant tree reminiscent of Poltergeist. Though an ostensible supporter of left-liberal causes, Spielberg seems in tune with the depressed era of conservatism in America. Set in the heyday of the “Greatest Generation,” this film is an all-white fantasy: the only face of colour appears in a hospital scene on yet another boy victim, one with a pitifully injured leg. Meanwhile, the script inveighs against income taxes, sentimentalises ‘family values,’ and winks with nostalgia for a pre-feminist world of airline ‘stewardesses.’ How long before Spielberg embraces his inner Republican? Robert Keser teaches English and Film at National-Louis University in Chicago and writes regularly for Daily-Reviews.com and Bright Lights Film Journal.